This old piece of false acacia was perfect for this project, and not much else! We have had many requests on how to create a bowl that isn't turned on the lathe. Many have commented that they want a more organic form that one can achieve on the lathe, too. 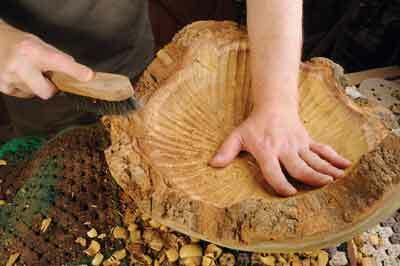 Hand working bowls gives you total control over the shape and decoration and frees you up to create what you wish. We looked at how these were done of old. A variety of tools were used from axes, adzes, knives of various shapes and bends, chisels of various shapes, and specialist long blades that pivot off a fixed secure point. There are also the modern power tools and shaping cutters that can be fitted to an angle grinder and another modern tool that is used by some - the chainsaw. 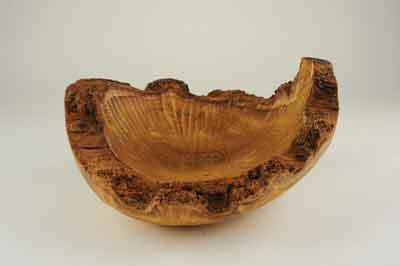 There is still a vibrant and healthy woodworking community that makes hand-worked/carved bowls. We then pondered this further and looked at what tools the average woodworker is likely to have in the workshop and from this we came up with this project. 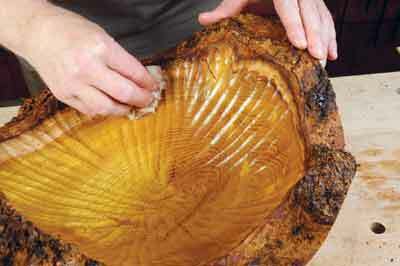 The beauty of hand-working/carving bowls is that time is not important and you can pick up and do it when you choose. You can also use timber that turners may not because of size, splits and shakes which make it unsafe for turning but can add wonderful features and hand-worked designs. We found an old gnarly piece of false acacia (Robina pseudoacacia) in the workshop which had splits and cracks in it - useless for turning but ideal for this. 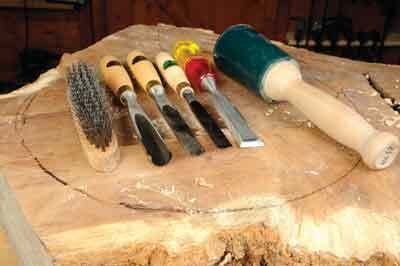 The hand tools needed are three carving tools of various curves - starting from a very deep 'U' curve to a shallower one, a standard bench carpenter's chisel, a mallet and a wire brush. If you do not have such carving tools, you could use out-cannel carpenter's gouges which have a similar profile to the mid 'U' shaped carving tool. Note the marked circle. This was done so I could have a rough idea as to what area I wanted to work with. Some areas were very shallow and some deep, so I picked the best area to create some conformity of shape. Depending on the wood shape you have, you can start shaping with a gouge almost immediately, but I laid a circle gauge on the top knobbly section and used it as a template to cut around on a bandsaw. It doesn't have to be exact, but any timber you take off makes the shaping process quicker. Remember to follow all safety instructions when using a bandsaw, keep the work stable and solid and keep all fingers out of the line of cut of the blade. 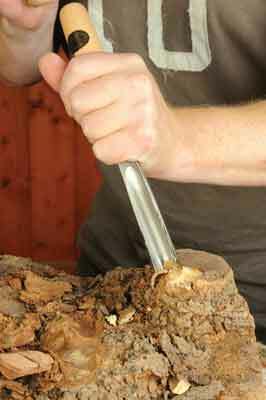 The issue most will encounter is how to hold the work whilst you carve it. You can try clamping it, but you need to move the work frequently. 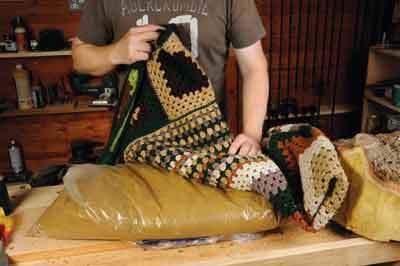 There is another option and that is to take a bag of wet sand and, depending on the strength of the bag to resist the risk of puncturing it, you can cover it with an old blanket or similar and this will act as your support. The wet sand moulds to the shape of the surface placed on it. It does not stop all movement, but does minimise it enough to work it safely. 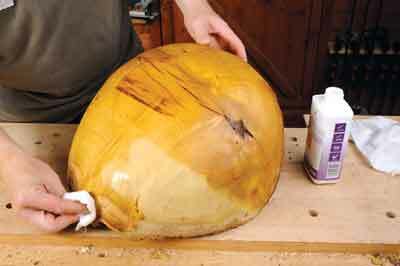 Cut the underneath of the bowl first, and now lay the knobbly bit onto the sand bag and take the deep-shaped gouge and start by removing the corners, making multiple light or heavy cuts as you choose. It is a good way of working through the frustrations of the day as nothing cut-wise can really go wrong. Everything can be altered and changed as necessary. There is a big jump in sequence now, but the simple fact is you have to work around the bowl creating the curve and shape you require by making repeated cuts that minimise the risk of tearing the grain. You can see the area that will be the base. About one-third of the overall diameter will be about right. It can be a bit tricky near the bark edge, especially if you wish to retain it. 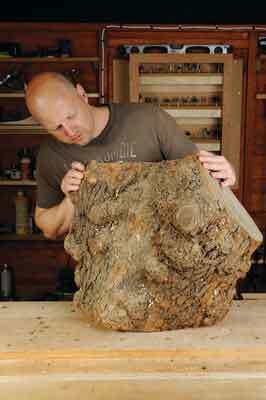 I did, so did not cut directly into the bark from the solid wood section. If that had happened, I might well have forced the bark off, so to speak. We can refine this bark area from the other side. Minimise pressure on this area by cutting obliquely, sideways or from the top in the bark zone. Once the outside is roughly shaped, sort out the bottom area. 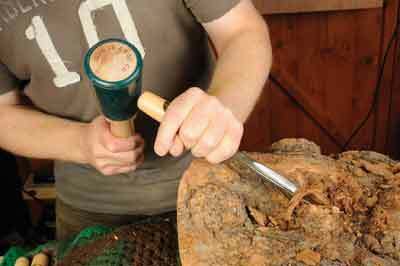 A standard chisel can make light work of creating a flat foot for the bowl to sit cleanly on. Turn the bowl over to work out how you wish the bowl to sit and cut the base accordingly. Check often to make sure you have it right. It is up to you if you leave the gouged surface as it is or refine it somewhat. We decided to refine the surface so it was smooth. 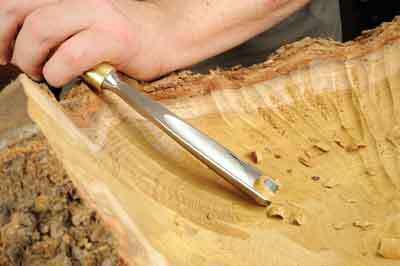 Take a shallower gouge or the carpenter's chisel and smooth out the deep gouge marks. 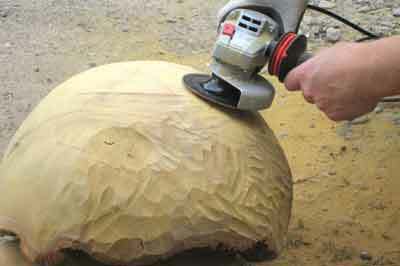 A random orbital sander fitted with a coarse grit makes light work of smoothing out other surface irregularities, but of course, the shape is not regular and even. It gently undulates so the foam pad on the sander gets in all of these curves nicely. Work through the grit grades to create the surface refinement you require. 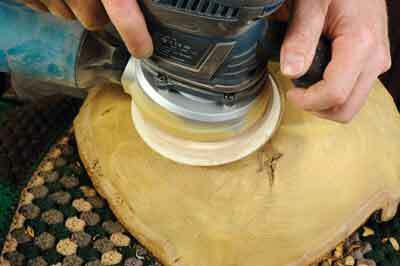 A fast option is to use an angle grinder and sanding attachments for finishing the surface of the outside. 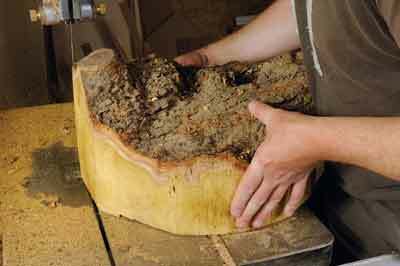 You could, with very coarse grit grades, use such a system for shaping the bowl, too. There are even special carbide disc cutters to fit on angle grinders that help with this type of shaping. As I said earlier, there are so many options open to you. Whatever route you choose, make sure you follow the recommended safety instructions. If power carving with grinders, etc. the dust and debris is considerable. Do it outside and wear face and lung protection and gloves to protect yourself from the dust and debris. Once happy with the outside, flip the bowl over and start shaping the inside. You have to have a clear idea of how you wish the bark edge to be. 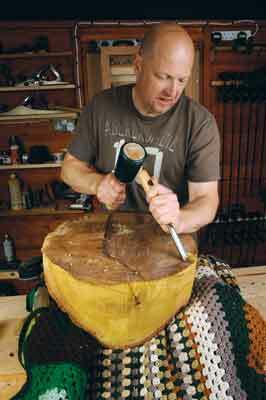 Other than that, you are working from the top gnarly face down into the centre of the bowl with a carving chisel again - the deep gouge works great to start with. The high sticking out branch part needs careful attention. An oblique cut is better than one that starts from the top, going down to the centre section. 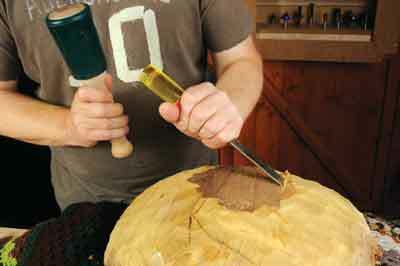 Keep repeating the cuts working from the edge, maintaining a relatively bark-edged rim form. Note the smooth section on the right. I wanted to do this inner section in two halves - one side cut by hand and the other using sanding discs. The sanding discs saved over two hours in time, though far more mucky. 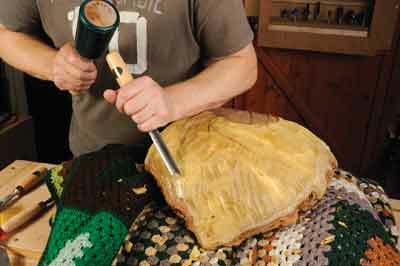 whilst quick and easy to do, as long as you take regular breaks to prevent hand fatigue, there is something about hand-cutting with a chisel that is wonderfully satisfying. 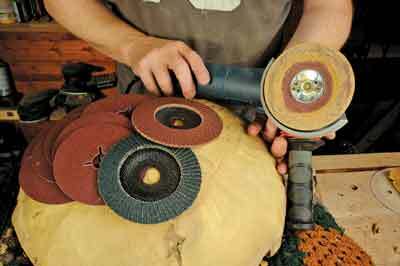 There is also a cost in the abrasives as they can wear out quite quickly. 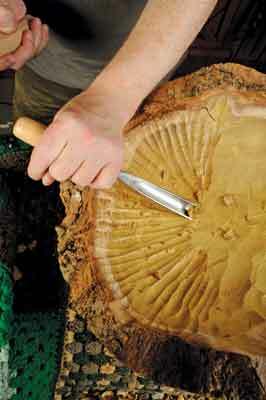 Carve the interior until you have the depth and shape you need, then decide if you want a smooth or carved texture. The hand-cut side has grooves running from the top into the centre which run in that approximate direction, influenced by the late David Pye, a brilliant turner and carver, who developed a hand-operated jig to create wonderful gouge cuts that although not quite uniform, were very close to being so, hand-cut running from rim to the centre of his work. 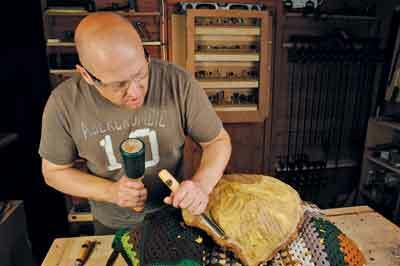 His book The Nature And Art Of Workmanship is fascinating and well worth reading. Work from the top of the bark edge down to the centre of the bowl keeping the cuts as close as possible but allowing the full cut of the blade width. If there are gaps between the grooves make a new cut in the blank area and run it as far as you can. The depth you can go is determined by the angle you can cut with the straight gouges and the bevel angle. 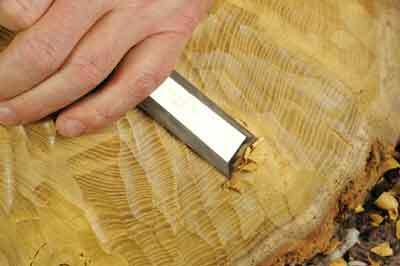 To maintain a bevel rub cut in the deep areas may be tricky as the handle can foul the top bark section. After the carving has been done, and you can see the gouged cuts, it is time to clean up the bark area. 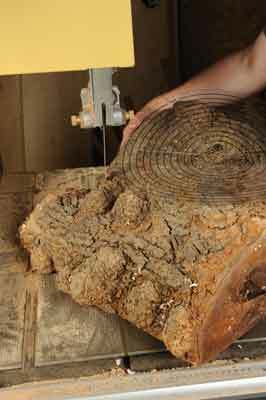 Some timbers will not require the following treatment, but this wood is old, dirty and the bark is gnarly so a wire brush can be run over it to clean it. After brushing, clean the piece up with a soft bristled brush followed by a damp - not wet - cloth to get rid of the remaining dust. Flip the piece over, wipe with a damp cloth, let it dry then apply finish of your choice. I used a Danish oil, which can be applied with kitchen towel or a cloth. 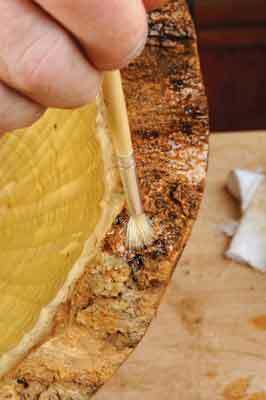 Once the outside is done, wipe off the excess oil after about five minutes, then turn it over and oil the bark edge. A brush is the best method for getting into the nooks and crannies of this rough bark. Oil the inside using Danish oil. When using finishes such as oil, make sure you dispose of the old cloths and paper towel properly to avoid risk of fire. You now have your own unique and organic bowl form.